Janice Kaplan cried on New Year’s Eve. She snuggled with her husband and watched a movie before the crystal ball dropped in New York City. She didn’t want her year to end. I can’t think of a single New Years when I cried because I didn’t want the year to end. Nothing special happened during her year. One thing made her year remarkable, gratitude. She chronicled her journey in, The Gratitude Diaries. The benefits of gratitude make it seem like snake oil. Better health, longer life, less stress, and more restful sleep to name a few. Gratitude makes you a better person. 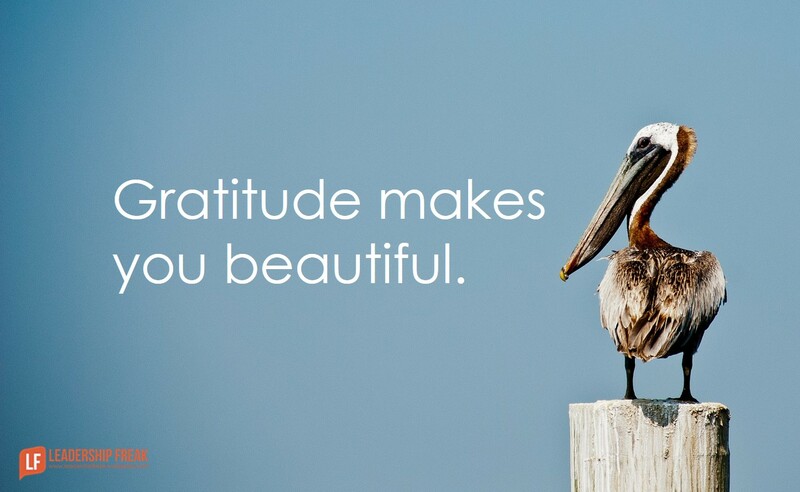 Gratitude makes you beautiful. Ungratefulness is toxic. Gratitude answers arrogance and nurtures humility. Something most of us could use more of. Gratitude lets others know they matter. All leaders can take this one to the bank. #1. One leader said that he withholds gratitude in anticipation of people falling short next time. #2. It’s hard to be grateful for people who fall below our own greatness. #3. We just don’t have time to express gratitude. We’re in a hurry. #4. There’s a lot of stuff that could and should be better. I’m reminding you of something you already know, but don’t always practice. Put a gratitude list on the fridge. Add one item a day. Say, “Thank you,” for small things. Take a gratitude walk-about. Pat people on the back. I’d like this year to be so great that I cry when it’s over. How about you? How might you practice gratitude this week? Afterword: Just after posting this article, a bird flew over and crapped on my keyboard. Thankfully it was a small bird. A few minutes later, a butterfly flutter close to my face. Hmmm??? LOL, Thankfully, you can work outside. 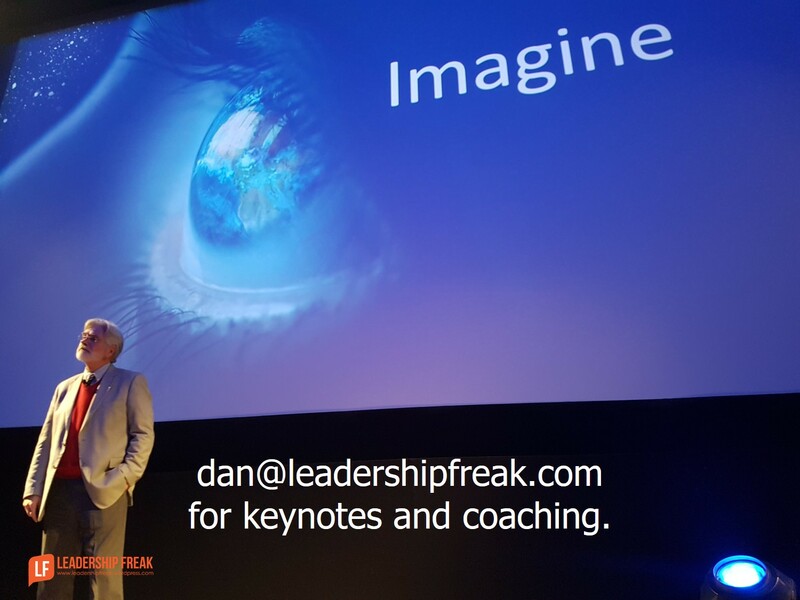 Dan, Gratitude and humility. Small bird gratitude. Humility for the butterfly and the perfection of God’s work. Actually saying the words “thank you” to a person (response inspired by your afterword), irrespective of size of achievement, doesn’t even need to be an achievement, more an acknowledgement, politeness. Sometimes what may be the simplest of things, can mean, inspire so much. Isn’t it strange, although some things may be referred to as the “simplest of things”, they can be the ‘hardest’. Thanks Thinker. We forget to do the simple things. Maybe they feel too easy. Thanks for the reminder that they matter. They do indeed matter. Perplexing, irrelevant of circumstance, whether professional or personal, why the simple things either get ‘downgraded’, put to the side, forgotten entirely turn out to be the hardest. Maybe they should be treated with the reverse. I don’t want this year to end because my husband is dying from glioblastoma and doesn’t have much time left. In a world where no matter how hard I work and throw my weight against a problem – I cannot change the outcome, I’m grateful for every tiny moment together, regardless of how perfect. Gratitude is a choice. And in the end, it is we who dictate what we get out of life, even when she’s handing out what we so desperately do not want and are completely unprepared for. In the end, even when it’s painful, it is we who can transmute that experience into something worthy. Thanks Julia. Your comment is so powerful. I’m sorry to hear about your husband. I think about my friends who are going through tough times when I write something like this post. Gratitude isn’t frivolous. It isn’t always easy. It doesn’t turn everything into Disney Land. It does make a difference. I’m thankful for your powerful comment. I get the feeling that you will enjoy every tender touch, every glance of love, ever moment…. even as you feel the sorrow. You honor us with your comment. http://www.aberrantcrochet.wordpress.com/Julia – sending you love and positive energy. You are inspirational. Your comment touched me and nearly brought me to tears. So often we think of showing gratitude to the people who do things for us – for those who may not know that we appreciate the effort. Your comment reminds us that gratitude should be shown for the precious seconds we have with each other on this rock we call home. My thoughts are with you and your family for strength. You have shown courage in your comment. Thank you for sharing. My sister died of GBM a few years ago. The last two years of her life were among the best of mine. I counted every second, treasured every word she said, sang with her, laughed with her, just sat with her and lived deeply every moment that we had together. I wish the same for you Julia. “In the end, even when it’s painful, it is we who can transmute that experience into something worthy.” Your words are spot on. I’m on board with the “Thank you” seems to be lacking more in today’s world. I notice our vendors are saying “Thank you’ for orders and I’m saying “Thank you” to our customers so it can be a circular effect. Depending on ones up bringing manners works with gratitude in a gracious sense of kindness. Bird crap and butterfly wings… God has such a sense of humor. You obviously get it and I thoroughly enjoy reading the results. Thanks for the teaching, Dan. I seriously considered having a bumper sticker made for my car that read: “Warning! Driver subject to frequent and sudden gratitude attacks!” Decided that might create a little unwanted distraction on the highways. And, full disclosure, would require me to always look like I’m living up to the claim. Ouch. Maybe I should have it made after all. I really appreciated this post and the dialogue. It’s so easy to get caught up in the fast paced life and the busyness most of us are experiencing these days. But now more than ever, I feel it’s important to slow down, take a moment, and be grateful. Easy to say, harder to do! I may need to read this post a couple of times a week to really remind myself. Thanks for the suggestions; I am definitely grateful for your blog and insight. Dan, I’ll see your four and raise you “there’s nothing to be grateful for”. If your having to be grateful you didn’t fall down the stairs, you’re having to try too hard.